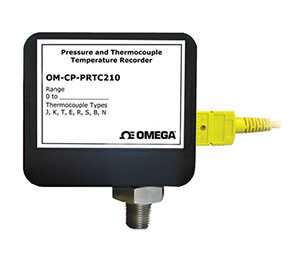 The OM-CP-PRTC210 is a pressure and thermocouple temperature data logger, ideal for use in factory settings. This device is available from 30 to 5000 PSI and features a 1/8" NPT fitting for quick connection. The OM-CP-PRTC210 has a real-time clock and a battery life of up to 2 years. This all in one compact, portable, easy to use device has a high-speed download and can measure and record up to 21,844 readings per channel. The storage medium is non-volatile solid state memory, providing maximum data security even if the battery becomes discharged. The OM-CP-PRTC210 can be started and stopped directly from your computer and its small size allows it to fit almost anywhere. The OM-CP-PRTC210 makes data retrieval quick and easy. Simply plug it into an available COM port and our user-friendly software does the rest. The software converts a PC into a real-time strip chart recorder. Data can be printed in graphical and tabular format or exported to a text or Microsoft Excel file. 참고: Comes complete with 3.6V lithium battery. Operator’s manual and USB interface cable are included with the OM-CP-IF200 windows software (required to operate the data logger and is sold separately). To order data logger with NIST calibration certificate, add suffix “-CERT” to model number and add $60 to price.